The well regarded Saffron Lady (pictured) will be looking to maintain her unbeaten record this preparation when she lines up in the Rating 65 Pearl Series event over 1400m at Matamata today following a super impressive first up performance last month. The 3YO daughter of Iffraaj managed to overcome missing the start and producing an electric turn of foot when breaking her maiden at Counties over 1200m. While there are slight concerns as to whether or not she can handle heavy going, reports suggest she may just be good enough to get away with it. 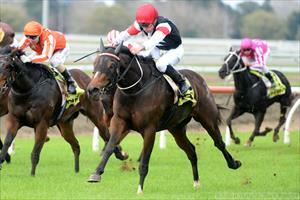 “She was super last time out and she has only thrived since,” co-trainer Pam Gerard said. “Our riders believe she will cope with the going and she deserves a chance to prove herself in those conditions. If she does, you’d have to think she will be competitive on the back of her last effort. Saffron Lady carries the colours of long-time owner Barry and Deidre Neville-White and will be hoping to make it back to back wins today on the home track. The second runner on the card is the lightly tried stayer Saint Finn who will line up in the 2100m highweight event – the first race on the 10 strong card. Saint Finn was due to line up last week at Pukekohe, but due to the cancelation, the team felt he was best placed here at home where little travel was required. The son of Red Giant continues to grow and strengthen and has illustrated very positive signs that he could develop into a promising stayer. “He’s another to which we aren’t sure about the track conditions, but he was worked in them well enough to suggest he can cope,” Gerard said. Saint Finn is raced by his breeder and owner NZ Thoroughbred Holdings Ltd and carries the colours of prominent owner/breeder Gerry Harvey.